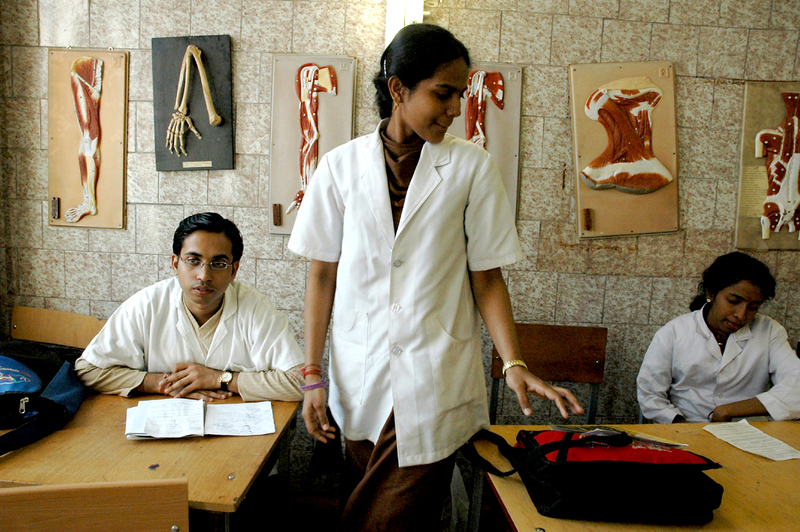 Indian students at Mechnikov St. Petersburg State Medical Academy. Technology in modern times is not only a driver of economic growth for countries, but also the means to advance universal prosperity. This explains why many countries develop technology both domestically and through international cooperation. Leaders of India recognized the importance of science at the very outset of the formation of the newly independent state. “Only science can solve the problems of hunger and poverty, poor sanitation, and illiteracy... We have to resort to science to help us at every step... The future belongs to science and to those who are friendly with it,” wrote Jawaharlal Nehru, independent India’s first Prime Minister. In this area, India was faced with two acute problems – training of qualified personnel to work in knowledge-intensive industries, and creation of a research infrastructure. However, at that time, there were many problems that required significant amounts of government spending – such as the low level of education and poverty among the population. The problem in higher education was a lack of staff, equipment and research capacities. Nehru appealed to the Soviet government for assistance to open the Institute of Technology in Bombay, which was opened in 1958. It was during this period that relations between India and the Soviet Union were born. The Treaty of Peace, Friendship and Cooperation, signed in August 1971, was the first official document to identify common objectives and areas of cooperation in the field of economy, science, technology and culture. The Soviet Union was actively involved in the creation of manufacturing industries in India, providing soft loans and bringing its expertise to the construction of industrial facilities. At the same time, the USSR transferred technologies to India, involved local experts in the transfer of experience. With the assistance of the USSR, around 120,000 Indian professionals were trained between 1950 and 1980. Scientific and technical cooperation was hived off into a separate priority area in 1987, within the framework of the Integrated Long Term Program of Scientific and Technical Cooperation, for which an agreement was signed by leaders of both countries. The reforms which occurred in both countries in the 1990s did not change their commitment to the chosen path, and the Comprehensive Long-term Programme, for the years 2000 to 2010, was signed. This was the main mechanism to collaborate in the scientific and technical sphere, to develop joint fundamental and applied research, and to create new technologies and joint ventures. A total of 71 institutes in Russia and 55 institutes and laboratories in India were involved in the implementation of this programme. The most successful area of ​​cooperation was biotechnology. India’s first polio vaccine was jointly developed, producing 100 million doses of the vaccine annually. BIBCOL Corporation (Bharat Immunological and Biologicals Corporation Limited) was created to produce these vaccines. Cooperation in the field of laser technology helped to open a specialized TB facility in India, where the disease is treated with lasers provided by Russia. Active cooperation in the aviation sphere includes not only joint development, but also the training of Indian specialists. This made it possible to build the National Aerospace Laboratory, the first experimental aviation design bureau in the history of India. The Indo-Russian Centre for geophysical instrument manufacturing was built in the city of Chandigarh. Russian sensors with Indian digital recording devices allowed organizing an observation network to forecast earthquakes, consistent with the global network. The Institute of Nuclear Physics, Siberian Branch of the Russian Academy of Sciences, in cooperation with the Centre for Advanced Technology in Indore, with the participation of the Atomic Research Center in Bombay, set up an industrial electron accelerator – the ILU-6. In Indore, a unique radiochemical research centre is being built. Financial support provided for scientific cooperation is also expanding, from both governments. An annual programme of joint tenders and projects has been functional since 2007, realized by the Indian Department of Science and Technology (DST) and the Russian Foundation for Basic Research, with funding of up to $20,000 for each project being provided by both countries. Over the years, this programme has supported 133 joint research projects, of which 88 have been successfully completed. 2015 was an important year for cooperation between Russian and Indian universities. Nine Indian and 21 leading Russian universities signed a declaration to establish the Russian-Indian Universities Association on May 8, 2015, primarily to create a platform for joint scientific and educational programmes. This Association has become a platform for academic mobility of Russian scientists and teachers within the Indian government’s programme called Global Initiative Academic Network (GIAN). As part of GIAN, scholars and teachers of Russian universities have the opportunity to lecture at Indian universities and research organizations, with all expenses borne the Indian institution. Russia and India have a long history of good relations, but their potential is far from exhausted, particularly in the sphere of science and education. With the support of the governments of both countries, good prospects exist to take scientific and educational cooperation to a new level, ensuring not only world leadership in advanced sectors, but also for improving the quality of life of the people in India, and in Russia.